Have you ever wondered what drones are all about? Drone is a term used to loosely describe aerial devices that vary in function from being able to launch weapons for military forces to taking ultra-high-resolution photos for the hobbyist, and can scale down to the miniature versions the size of a mosquito. After seeing a drone in use and talking to numerous people, I decided to buy one to take aerial video and still photos. The drone is a Phantom 2 Vision Plus manufactured by DJI. It has a very sophisticated flight control system and cost $1700 with a spare battery. The main body of the aircraft contains a removable rechargeable smart battery and has a realistic flying time of 25 minutes. Propellers are fitted to four small electric motors, which control the altitude, speed and direction of the drone. It weighs 1.24kg and measures 400mm x 4000mm x 180mm. I have fl own it 500 metres away and up to 280 metres high; I believe it will fl y higher and further. Everything is controlled through a hand-held remote control. This particular drone was promoted as being ready to fl y straight out of the box. That is almost true. I had to connect it to the Internet and download the latest software, something that now seems mandatory with many products but is easy to do. I thought there would be a significant learning curve to become proficient, and feel confident enough to fl y in most locations, especially over water; I was wrong. As the drone has a sophisticated flight control system and built-in GPS, I mastered the controls and was confident enough after five flights. 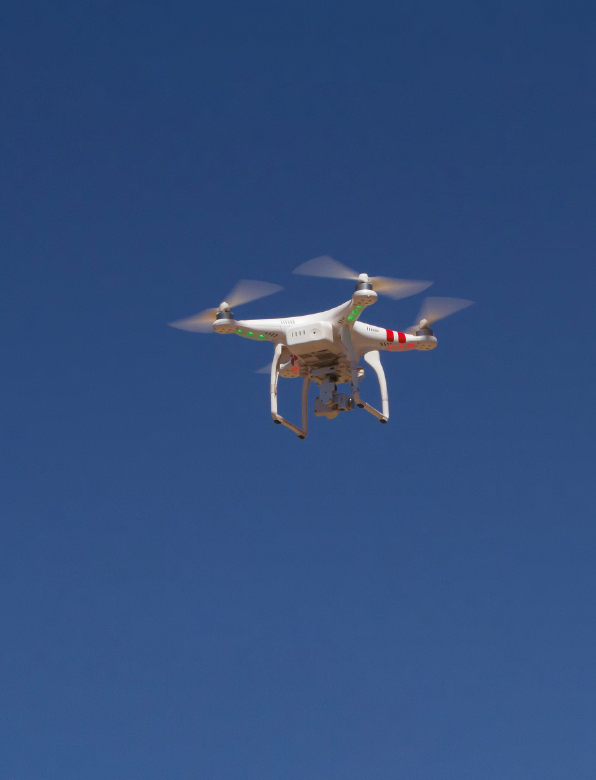 The usual problems associated with flying remote-controlled aircraft are gone. For example, letting go of all control will cause the drone to hover without drifting, usually within a space of one cubic metre, even in a stiff breeze. This level of control allowed me to concentrate on photography rather than flying. Mounted under the drone’s body is a three-axis gimbal holding a 14 megapixel camera, which produces very good video and still shots. The gimbal’s small electric motors keep the camera level when the drone pitches and rolls. The camera is controlled through a Smartphone attached to the remote controller, and displays the image seen by the camera as it happens. The camera’s direction, angle, video on/off, photo quality, image size, and all other camera functions are on the Smartphone. The drone is connected to a computer and videos and photos are downloaded for subsequent viewing and processing. As all the flying I have done has been outdoors, glare on the screen required a hood to be fi tted to the phone; a simple cardboard surround does the job. 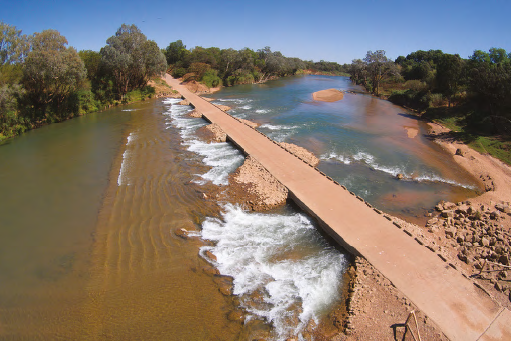 My first attempt was at the Daly River Crossing, all I could think of was flying the drone into the river, and then some interested people made it a little harder. Somehow I answered their questions, flew the drone and took the shots all without a problem. I was very happy. This drone has flight restrictions built into the software that limits flying within 8km of every commercial airport in Australia. Close to airports the drone will not fly at all, as you move further out flying height limitations are enforced until you are outside the 8km radius where all restrictions are removed. These restrictions are necessary as safety and security are paramount. At all times during a flight, the altitude and distance from the point of take-off are shown on the Smartphone display. A radar function is also displayed showing the position and direction that the drone is heading. This is handy as the drone can be very difficult to see at times and disappear from sight altogether in bright conditions. If for any reason you want the drone to return home immediately, a flick of the control switch will send it back to the home point where it will land unaided. I don’t want to over simplify the use of this device, and I did improve my skills considerably over the last six months, flying it in many locations during our trip this year from Darwin to Tasmania. The aerial video is quite spectacular and the different perspectives produce some very good still shots. I decided to fly the drone from our boat to photograph some crocs close up and land back at the boat. We found the crocs to be very wary at first, no doubt they had probably not seen or heard a drone close up before. We managed to get a lot of good shots, some as close as a metre. The explosive power and speed of a big croc is incredible. They look slow and lazy. They’re not. The drone has many good features including a return to home point, which is automatically determined by the Flight Control System and GPS when taking off. This feature will activate automatically in the event the battery reaches a predetermined critical level. Obviously care has to be taken when taking off from a constantly moving boat. Landing back in the confined space of a boat is not a good idea. We found it much easier to hover the drone, take hold of the landing gear and turn the drone off. 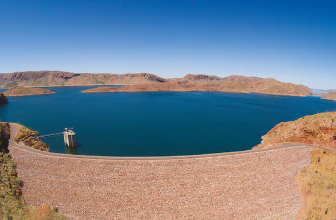 The Argyle Dam provides excellent photographic opportunities. Flying up the face of the dam to expose the lake is quite spectacular and stopping the video to take a still shot is easy. 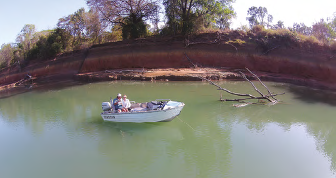 The Kimberley offers limitless opportunities. 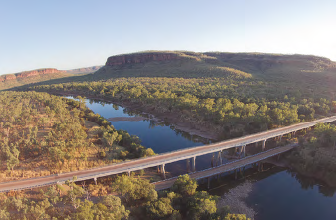 Many members will have photographed the bridges on the Victoria River but unless you take the helicopter ride you just can’t get the photo from this perspective. 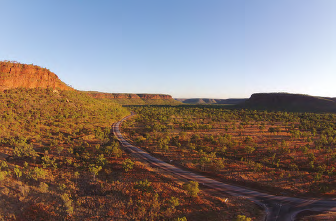 This shot (above) was taken at sunrise, looking down the valley from a point near the Victoria River Roadhouse at an altitude of 400ft. The little bit of height exposes the view. Strong wind can cause problems that require more attention to flying than photography and when that happens it’s best to land safely and try again later. Some of the most scenic locations are on or near the ocean so it’s necessary to take particular care as wind gusts can be catastrophic and mean losing everything. Fortunately, that hasn’t happened. I have now flown the drone with confidence in most conditions including the Bay Of Islands on the Great Ocean Road. There has been a lot said in the press recently, mostly regarding privacy. There are laws that cover the use of drones and as usual it’s the very small minority that abuses them and create issues for everyone doing the right thing. Then, the press often sensationalises these events. Around Australia the photo opportunities are endless and the drone can take you to places that previously you could only imagine. 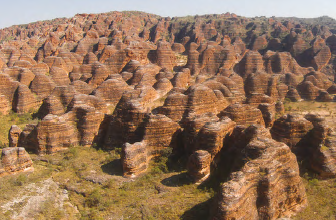 The Bungle Bungles, Katherine, the monster on the salt lake and Port MacDonnell’s cray fishing fleet are just a few (below).